APPLETON, Wisc. — A Wisconsin man who was found guilty of attempted first-degree intentional homicide of an unborn child was sentenced this week, admitting in court that he sought to end the child’s life because he feared the baby would have medical issues like his other son. 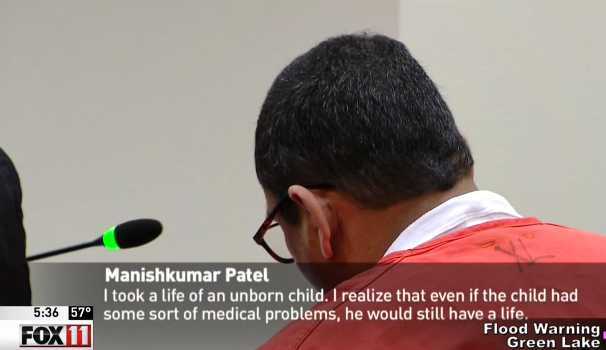 Manishkumar Patel, 45, was sentenced to 22 years in prison on Tuesday after being convicted in August of spiking his girlfriend’s smoothie with an abortion drug. She didn’t drink the smoothie, suspecting that something was not right, but miscarried not long after the incident. Patel had evaded law enforcement for a decade, fleeing the country after the incident occurred in 2007. He was charged in November 2007 and arrested in January 2017. According to the Appleton Post Crescent, Patel and his girlfriend went to a restaurant for dinner in September 2007, followed by an ice cream shop for dessert. She waited in the car while he bought a smoothie, and when she saw him pouring part of the smoothie into another cup and “stirring frantically,” she became suspicious and didn’t drink any. After noticing that there was white powder in the cup, the woman later returned to the ice cream shop to ask about the substance, and was told that the business does not put powder in their smoothies. Patel’s girlfriend then sent some of the drink to a lab for testing, which confirmed that the powder was RU-486. “RU-486 is an abortion drug. It is not the morning after pill; it cannot be dispensed by general doctors or prescribed or [made] available through a pharmacy,” Outagamie County Court District Attorney Melinda Tempelis told reporters. The woman obtained a restraining order against Patel, whose house was later searched by investigators. According to reports, police found an envelope of pills that Patel acknowledged were “abortion pills” that he had shipped to him from India. Patel had fathered a child with the woman in 2004, and his son was born with a lifelong medical condition. She became pregnant again in 2006, but soon miscarried, and when she was with child for a third time, Patel sought out the abortion pill out of fear that the baby would be like his son. During his sentencing on Tuesday, Patel acknowledged that his behavior was wrong and without excuse. He said he fled the country to see his father, as he thought it might be the last time.